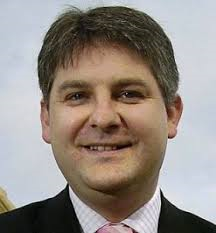 Congratulations to Philip Davies, MP for Shipley, both in getting this debate in parliament – for the first time – and also in giving a pretty good run down of many of the key issues for men and boys, despite the evident opprobrium from the other members. Apart from Philip Davies the other members were determined to discuss only the suicide issue. Well, that’s better than nothing. Let’s hope a parliamentary debate on IMD becomes an annual event and that we can work round all the major issues in time. Who knows, perhaps the idea that males do actually experience substantial disadvantage may, in due course, cease to be a suitable subject for mockery. I’d like to make a few observations about what was said by MPs other than Philip Davies. …the emotional education that we give to young men in this country is very poor. No matter how modern and how diverse a society we become, we still seem to educate our children to feel that they have to man up and be strong, and that they cannot talk about emotions. I’m getting rather pissed off with being told I’m an emotional cripple. Virtually every speaker, in fact, made reference to men needing to talk more. Yet Jane Powell of CALM, the very organisation that many MPs praised, has made it clear that men do talk – the problem is that no one is listening. But the MPs just repeated the same tired mantra. The claim that men’s suicide results from emotional repression is unproved. This assumption is convenient because it places the blame on men themselves and lets society off the hook. And, whilst talking can do no harm, the emphasis on the “talking cure” is dreadfully gynocentric. Men are different from women, whatever some parties would contend. The Way Men Heal is different from women, and is focused on action rather than words. But so little attention is paid to men’s mental health that even this rather crucial fact is unknown to most. The MPs all paraded their gleanings of suicide data. But they all missed a simple point. 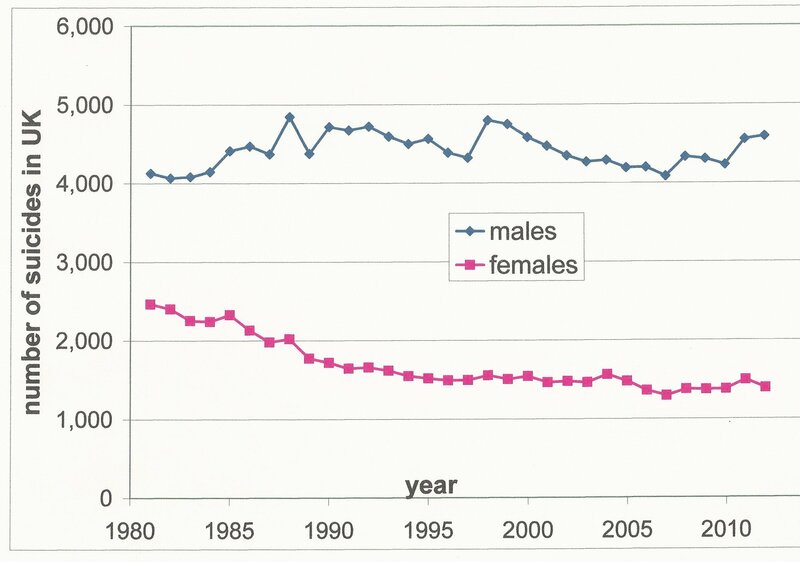 The statistic which has been increasing markedly over the last 35 years is the ratio of male to female suicide, not so much the absolute rate of male suicide. 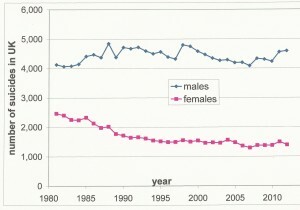 This ratio has been increasing because the rate of female suicide has dropped markedly, as the graphic below shows. Why did no one ask this staringly obvious question? Are they afraid of the answer? One might have thought that the question of what causes men to take their own life would have received more definitive research attention. None of the MPs mentioned that the ongoing absence of a definitive answer to this question might be related to a lack of focus on addressing it. For example, the Policy Research Programme is currently investing £1.5m over the three years 2013 to 2016 into six suicide-related projects. They cover self-harming behaviour, the situation of LGBT youth and the role of the internet and social media in relation to suicidal behaviour. Dare I say these sound rather feminist leaning areas? What is certain is that none of the money is being spent to investigate the causes of specifically male suicide, the demographic which accounts for 78% of cases. I repeat, dare they not address the issue because they are afraid of the answer? Data shows that parents who leave their children are almost three times more likely to die early. It was unearthed by Sunday Express staff who compared the number of Child Support Agency (CSA) cases closed after “nonresident” parents died with cases closed due to the death of the “parent with care”. The figures show that since June 2003, 8,515 non-resident parents have died compared to 3,090 residents. According to the information released under the FOI, 94.8 per cent of CSA cases involved a male nonresident parent. Some deaths are bound to occur when dealing with very large numbers of people. But the significant feature is the excess of 5,425 deaths of non-resident parents over resident parents. To 95% accuracy, this means an excess of 5,425 deaths of fathers over mothers. This is 12 times greater than the number of UK forces deaths in Afghanistan (30 times that in Iraq). As far as I am aware this alarming finding has led to no public outcry or governmental calls for further investigation. Finally, I’d like to dissect the speech made by Maria Miller, MP for Basingstoke, Chair of the Women and Equalities Select Committee and former Minister for Women and Equality: her words in italics, followed by my commentary. Women face discrimination on a daily basis—that is not a myth. The number of men who are currently sitting as MPs is greater than the number of women who have ever been elected as Members of Parliament. I checked that. It is true – just. There have been a total of 448 women MPs, compared with 459 men MPs currently. It’s also irrelevant. She is taking the Jess Phillips line – pretending she is unable to tell the difference between male MPs and men that are disadvantaged. It is a great privilege to follow the hon. Member for Bridgend (Mrs Moon), who has done more than anyone else to press for change on suicide, which affects more men than women. If we had had more women like her, and others, in this place over the past 100 years, perhaps more of the issues raised by my hon. Friend the Member for Shipley would have been better debated and more fully addressed, because such issues are often picked up by women Members of Parliament. Oh really? Then why have none of the 448 women MPs over history done so? And why, if women in particular are so very keen to address men’s issues, was there not immediate and vociferous agreement to this very debate – rather than controversy? Why, in fact, did the feminist lobby try to stop it? Even Mrs Moon, whom she cites, said virtually nothing specific to male suicide. The hypocrisy is breathtaking. International Men’s Day is not about pitching men against women; it is about the health of men and boys, the promotion of gender equality, positive male role models and men’s contribution to family life and their children’s lives. I have the privilege of living in a three-generation family, and women are in the minority, but we have fantastic support from the male members of our family to achieve the most that we can as women. Gender stereotypes are good for no one, and International Men’s Day should be an opportunity to address those stereotypes. Indeed so. And I have news for you, Mrs Miller. The prejudice that a man’s worth as a human being is defined by his relationship with a women is a stereotype – and one that the men’s movement repudiates. Suicides are a tragic waste of life, and it is important that we have strong policies to address suicide. Ahead of today’s debate I considered the driving force behind those suicides. The hon. Member for Bridgend touched on some of the issues that she has dealt with, and I am particularly interested in her comments about the expectations that we put on male members of our families and communities. I am also concerned about the impact of relationship breakdown and loneliness, which can be felt strongly by men, particularly as they get older. I will focus on that and on how we might start to address some of the problems that men have in trying to play a full role in all aspects of their community and in all aspects of life, as my hon. Friend the Member for Shipley mentioned. Whose fault is that? Nothing to do with feminism and the family courts, at all? When there is domestic violence or there are concerns about a child’s welfare, it is clearly right that a parent’s role in their children’s lives might be curtailed. Note how quickly Mrs Miller has morphed from male suicide to men’s domestic violence. She devotes almost all the rest of her speech to the feminist Main Issue which I quote at length to make that very point. However, there is clear evidence that, in day-to-day life, we could be doing far more to support the role of fathers in their children’s lives and to challenge the continuing gender stereotyping that it is in some way unacceptable for men to take up a more active role in their children’s lives……Parental leave is a particular case in point. In the UK, it is felt there is an attitude of frowning on men taking up parental leave, and 41% of men have said that that is one of the biggest barriers to their taking up their legitimate and legal entitlement to it…..it is not just a problem faced by the UK. In the Czech Republic, where parental leave legislation is the same for men and women, men still take up a fraction of their entitlement. The Scandinavian countries are often held up as paragons of virtues when it comes to family policy, but Finland has less than 9% uptake of parental leave by fathers. This is probably a Europe-wide problem—indeed, perhaps a global phenomenon. How can we ensure that men have access to parental leave, which can give them an important role in their children’s lives in the early days? There is undeniable evidence from countries that encourage parental leave, such as Germany, that if a father has an active role in a child’s life before the age of five, it can encourage, support and nurture a stronger lifelong relationship between them. That is important, and we need to understand it. We have the policy in place; how do we make it work for men? I applaud the Government for the work that they have done to ensure that the opportunity to request flexible working is now open to everybody, yet dads are twice as likely to have their requests for flexible working rejected by employers. Just under one fifth of fathers applying for flexible working are turned down. However, men are also less likely to apply for flexible working in the first place, with just 17% of fathers requesting flexible working compared with 28% of mothers. Yes, women still face all sorts of impediments to their progress in the workplace, but men face barriers too, perhaps due to inflexibility within Government structures or expectations that men should be the main breadwinner. We must address such issues to ensure not only that men can play a full role in their sons’ and daughters’ lives but that women too can make the progress they need to. Forgotten all about male suicide now, have you? Can’t remember how we got to talk about female employment? We must ensure that gender is never used as the basis for discrimination. You mean, like all-female shortlists for MP candidates? International Men’s Day does not dilute the issues that women face, including discrimination and gender-based violence. For which read: I’ve reluctantly said a bit about men, because I have to, but make no mistake it’s only women that matter. I understand Mrs Miller would have been excommunicated from the sisterhood if she’d not mentioned VAWG. It is an opportunity to challenge all gender stereotypes, which are not good for any of us, and to support men to speak out, as women often speak out, on behalf not only of women but of men. I repeat – which of the 448 women MPs have ever spoken in the house about the men’s issues listed by Philip Davies? This entry was posted in suicide on 23rd November 2015 by William Collins.